Not looking at OAL very much. The biggy with SWC is how much of the flat base you have protruding past the case. We have pretty much agreed on about a fingernail. Or around .006" all SWC not being the same anyhow that seems to be a good place to start. We just haven't agreed on how thick a fingernail is. It all depends on the barrel's chamber and leade. My SA Range Officer's chamber has no leade, while my Colt Series 70 with NM barrel has a ton of leade and allows me to seat the bullets out more. For convenience sake, I seat them all to fit the RO rather than the Series 70.
cdrt wrote: It all depends on the barrel's chamber and leade. My SA Range Officer's chamber has no leade, while my Colt Series 70 with NM barrel has a ton of leade and allows me to seat the bullets out more. For convenience sake, I seat them all to fit the RO rather than the Series 70. ....and that measurement is ? Just measured some. .020 is a lot closer then the .006 I posted. I am loading a bunch of Zero 185s right now (Not plated) and they are around .022-.025. Must have been thinking about my Granddaughters nails. Not knowing exactly what bullet you have it is very hard to give you a starting OAL. 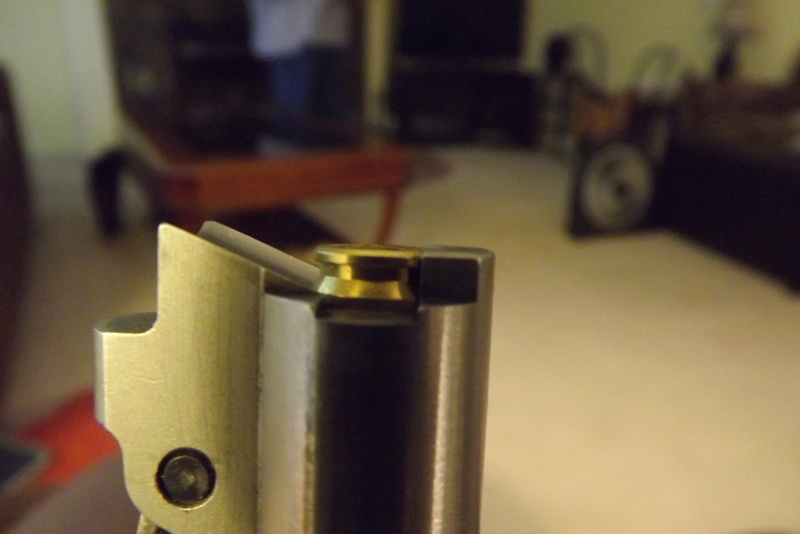 This picture is of a FMJ not a plated bullet but it shows the amount of shoulder I am using. I don't have any plated bullets. As shown in this post image by LenV, and adjust the seating of the shoulder for correct headspace. This may be different for each barrel, but only by a few thousands. As shown in this post by willnewton, the best bullet seating depth (for accuracy) headspaces on the bullet. Just a half a dozen months ago I started reloading. I used to base everything on OAL. That ended up being a disaster in having several 45's with differing barrels, chambers, and throats as well as differing magazines and springs. I have learned to go with a fairly average number measuring from the case edge to the lead shoulder .025". Jacketed is pretty much the same as is plated only its a tad harder to measure so an eyeball with the manly fingernail as a rule works out just fine .025" to .040". I check virtually every other round in a case gauge before it is boxed. Since doing this I can say I have had almost zero failure to load scenarios. Thanks for the good info in this thread guys. What works for me, may not work for anyone else. You need to check the chamber and see what works the best when you seat a loaded round with the barrel out of the pistol. If it is even with the hood, you are good to go. 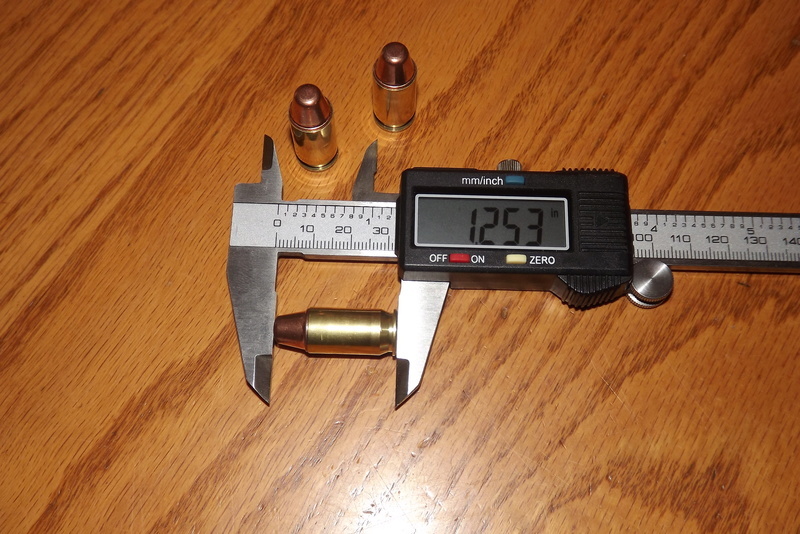 I load 200 gr SWC @ .920 measured from the back of the case to the shoulder of the bullet. I have found this to be a much more accurate way to measure rather than trying to measure the exposed shoulder. and once you determine what length you're going to use, get a seating stem that uses the shoulder rather than the nose. I shot next to a master who shot high 880's. I looked at his 185 and 200 loads and they were all seated flush. Be said it just simplified things for a his guns. With this being, "The information age!" I would think that folks would quit reinventing the wheel. Don't worry about COAL with semi-wadcutter .45 ACP bullets. Just let a little of the shoulder stick out the mouth of the case. If your pistol feeds the cartridge reliably, you are good to go. But but....you’re taking all the fun out of it. If we can’t re-invent the wheel what else can we argue about? Wobbley wrote: But but....you’re taking all the fun out of it. If we can’t re-invent the wheel what else can we argue about?